Every Trekking Event with BTC will always be a memorable one. We would end with meeting friends and gaining experience. 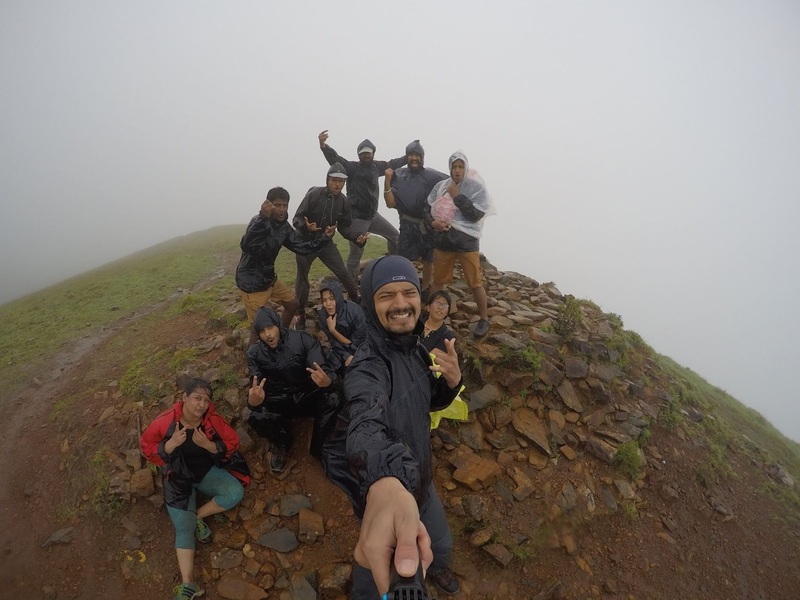 So this time it was a trek to Secret Place as per the organiser and Kudremukh National Park. 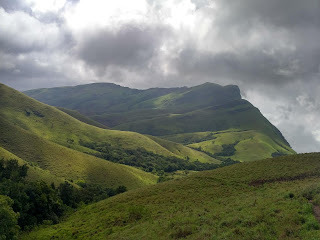 Kudremukh , (Horse Shaped Face) The trek was organised on 15 and 16. On Friday’s night usually Majestic Area would be buzzing with heavy traffic. Due to traffic snarl, I was late and had to call Parth Patel and inform that I would be late by 10 Minutes, who assured not to worry and will be leaving by 10.20. We departed at 10.25 from Majestic and started with introduction, BTC favourite Introduction ritual, i.e dumb charades, to make interesting, Parth Patel suggested if the name is correctly guessed easily, then the person would enact his surname or last name. Most of them delibrately guessed wrongly thus prolonging the introduction part but thanks to Brijesh Soni, my name was guessed rightly. However, I had to enact my last name, which was difficult and somehow I tried and was partial successful. The enthusiastic trekkers were Parth, Hiren, Bhagyalakshmi, Vinod, Magesh, Brajesh, Ananya, Shubha, Shyamali, Kunal, Ambrish, The introduction took so long and by 12, we had done our introduction part and slipped to bed. We were awoke by the chirping of the bird, then realised we have entered peaceful and tranquil Western Ghats. We reached the place named Ballagel from where we had trek 6 kms to a home stay at Mullodi instead of riding in Jeep. 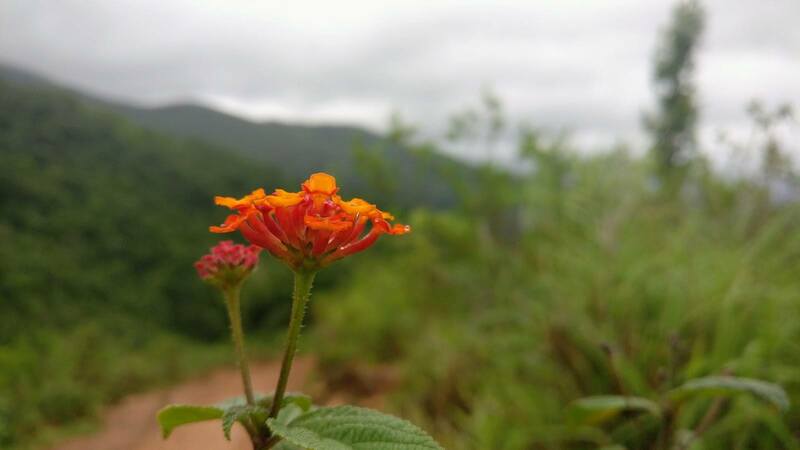 We were introduced to Western Ghats weather. It was raining and we made our way to the home stay in rain and fully soaked. We were introduced to Raje Gowda, our stay house host and then the host asked us to freshen up and have breakfast. We had breakfast of Idli and Pulao and were introduced to our Guide Krishne Gowda. We started out to trekking to undisclosed location and true to its character, the placed lived up to the expectation and also it was pleasant to trek in rain and with the changing weather conditions. It was bliss and we reached the tip of the peak. We started to descend and had lunch of Pulogri that we had carried. It was drizzling and good to seek two of the trekkers hiding in their poncho and having the lunch and it made out a nice moment. 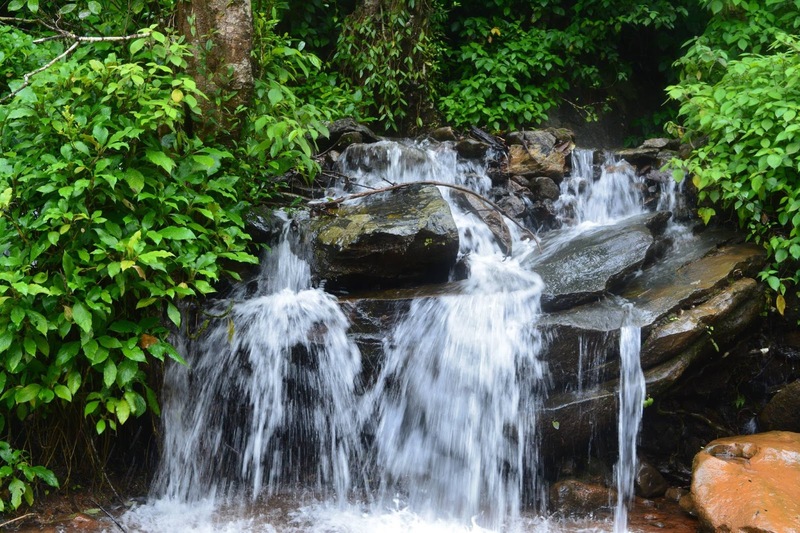 We trekked back and reached Somavathi water fall, the guide asked us to be careful and showed the location where we can get into the water with less current and force. 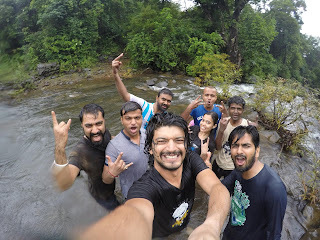 All of us got into water and dipped our self and played in the waterfall. We reached home stay and were served with hot piping Pakoda and in no moment all digged into that and in no moment it was gone and then requested for second serving, the host obliged and then came the tea. Later it was a time for game and started with UNO. I was unacquainted with the game of UNO and later Vinod assisted me and but with my folly, I had given away my last card which prevented me from cashing on the card. Dinner was ready and we had our serving of Chapati, Cabbage, Rice and Rasam with Papad and later it was game time and played game suggested by Parth and Hiren. It was fun game. After the game, in no time, all slipped to sleep and we were awaken by the sound of the rain falling on the roof and all were ready for another 18-20 Km trek to KNP. All were enthusiastic. Everyone was ready but Hiren dropped a bad news that Parth will not accompany for trek because of leg pain and all were feeling bad for Parth as it was one of his wish. We started with 10 members accompanied by our Guide Krishne Gowda, who briefed us about the journey. We took permission, the Forest Guard inform us that we need to return back by 6.00 p.m and reach the base point. Keeping in mind of the same, we started our trekking journey at 8.15. We commenced our trekking to KNP and the landscape was altering between forest, meadows and grasslands. We passed through the streams as it was start of the monsoon and we could hear the sound of gushing water. After trekking 2 Kms we reached where there was sign of direction and also notice board of Forest Department. We were cheerfully trekking in the rain. All were covered with ponchos and Rain Coat, a must necessary during the monsoon.. Krishne Gowda was in the lead and we reached Onte Mara (solitary Tree) but had confusion. We paused for a minute and so recharged our self with dates and biscuits. We started to ascend the 1 km Steep and was raining heavily which was making difficult to trek. We were frightened for a moment when a bolt of thunder hit and the sound was scary. We reached the horse shaped spine and continued our trekking to the tip of the peak. We passed through the stream and reached the point at 12.15 but there were strong winds and it was difficult to remain for us to remain more than 10 Minutes. Photos and selfies were clicked. 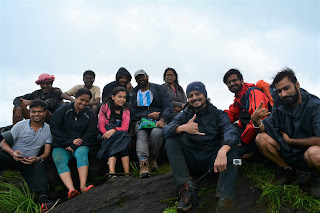 The satisfaction of reaching the point amidst braving rains, winds and leeches was great and rewarding. We had our lunch beside the stream and I was shivering but stood still. Later we start to descend to the base point. The weather conditions was varying and it was great to see the grasslands forest and meadows in full serene and hoping that it would be less rain. We passed through the forest, meadows, stream, and grasslands again and reached the stay home at 4.30, 30 minutes delay. Later it was time for packing bags, and we had nice hot bath energising us. The Host served us with hot tea and pakoda. We rode back through Jeep to place where the Tempo Traveller was awaiting us. As there was a plenty to time, Hiren suggested us visiting Annopooraneshwari Temple. We went and had prasadam and a time for BTC Rituals, i.e feedback. Everyone gave their feedback, thanking the organiser and also the team mates and special thanks to Ananya Chandraker who defy rain and wind and shot picture. The entire team were energetic and enthusiastic till the end of the journey even after trekking for 38 Kms in two days. We reached Bengaluru around 6.00 am and with heavy heart had to say good bye to each others. It was pleasant spending your time with the midst of the nature and also with enthusiastic friendly companions.